Afghanistan was a literal stones throw away. 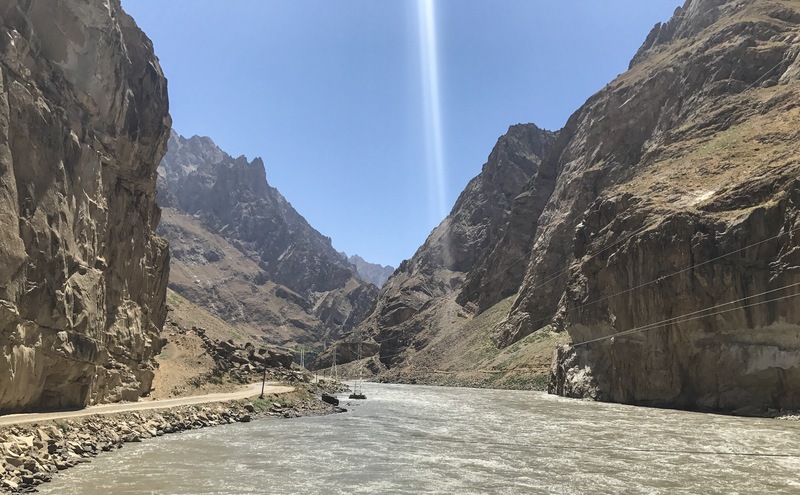 A 40 metre wide river fenced the border, with just enough space on the Tajikistan side for the single track Pamir Highway. An occasional grassy verge gave contrast to the pastel tones of the valley sides and had provided the perfect spot to pitch our tent the night before. For miles the road continued parallel to the river – a mud tinged gush of rapids that squashed any idea of an illegal swim crossing. The river provided the defence both countries sought, yet ironically, was the one line of division neither could control. 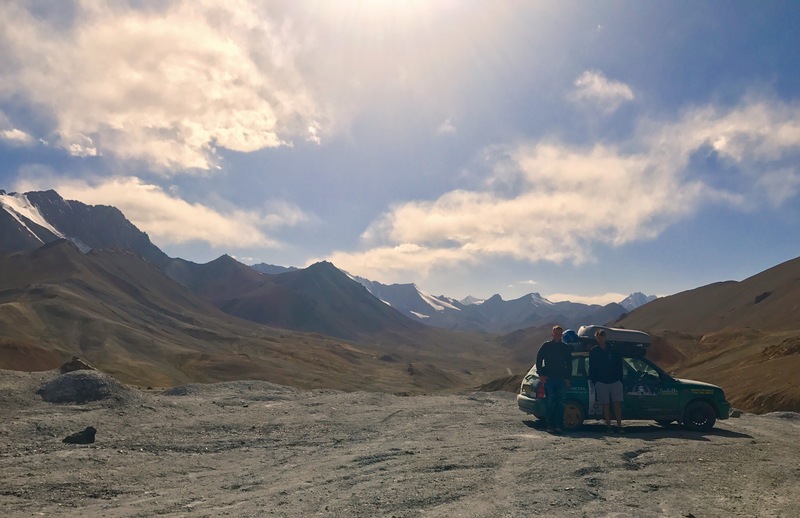 Our little Micra chugged along a thousand feet below the skyline, next to the very powerhouse that had created this massive gorge over a millennia ago – far longer than the feeble powers of a territory border had existed. 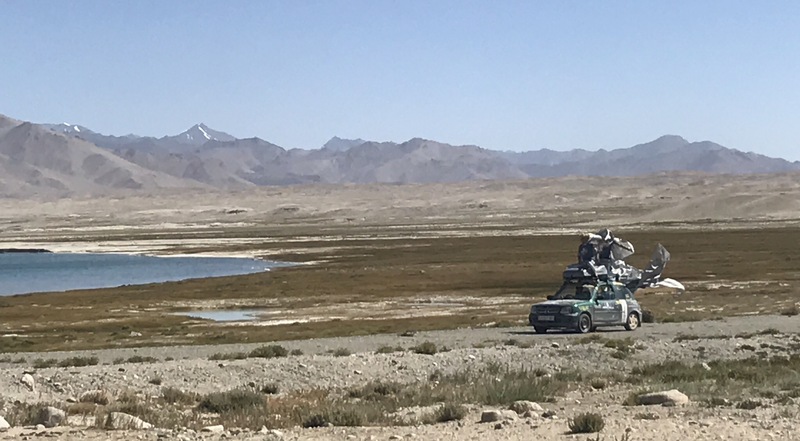 Khorog was the halfway point of the Pamir Highway – in time not distance. At 7,100 feet this small town, stitched along the main road south and still within eyesight of Afghanistan, provided temporary respite from the altitude that had previously made us a touch unstable. A pea size nail had deflated the front driver side wheel the day before and, with much of the same ahead, a friendly mechanic charged us a dollar to repair it – with some weird putty that whilst doing the job, would be far from road legal, or worthy, at home. From here we began to climb again. Speckles of snow now leaked out into entire caps that softened the edges of the peaks ahead. We’d drive for miles, staring at a single high point that gave us our direction; a dark shadow that peered above the cloud line. Until, after significant wear of first gear, we’d drive parallel to what was once the land that met the sky. A new high point would appear, testing further our tolerance to the altitude. That night we camped beside a large salt lake. We’d dropped a few thousand feet, but not enough to shelter us from freezing temperatures and aggressive winds. Between us we perhaps had four hours sleep. Despite thermals and four season sleeping bags it was bitterly cold, and every gust of wind slammed the sides of the tent into our shivering bodies. At this point we were keeping our body heat entirely to ourselves: the altitude was taking its toll on us all, and me and George had been at loggerheads for a few days. Both stubborn, our dislike of each other carried on for so long that we both forgot what we’d fallen out about. The open plains that we’d camped within provided the perfect spot for us to now whip out ‘The Priscilla Moment’. Our silver flags, horrific wigs, and carefully shaped capes picked up the wind as Chris accelerated across the dunes. Still not at body heat sharing level yet, we’d accomplished a key goal on our trip, kick-starting the day better than any blend of coffee. Under three layers, we hopped out the car for a picture, before hobbling back shortly after, almost entirely out of breath. The road weaved down, not sparing further peaking ranges and vibrant plains. As the air thickened, wiring shrubs thickened out into grass meadows, and small beaver like, but red, animals shuttled groceries to and from their road side tunnel systems. A 40km wide gap in the mountains began to appear as we approached Kara-Kul lake. Formed 10 million years ago and truly sea-sized, it appeared almost as a mirage as we steadily got closer. Beside it, a small hut piped smoke into the cloudless sky. Fired by dung, a crooked, once rectangular stove warmed the two rooms and fuelled the noodle and vegetable broth perched on top. We were welcomed in by a large golden smile, worn by a short lady with the most detailed face. With children no older than 13 or 14, her skin was that of a women much older. Her rich olive cheeks creased as she laughed with us, trying to work out English to Russian translation, but pictionary quickly secured a space on her floor and a warm dinner. 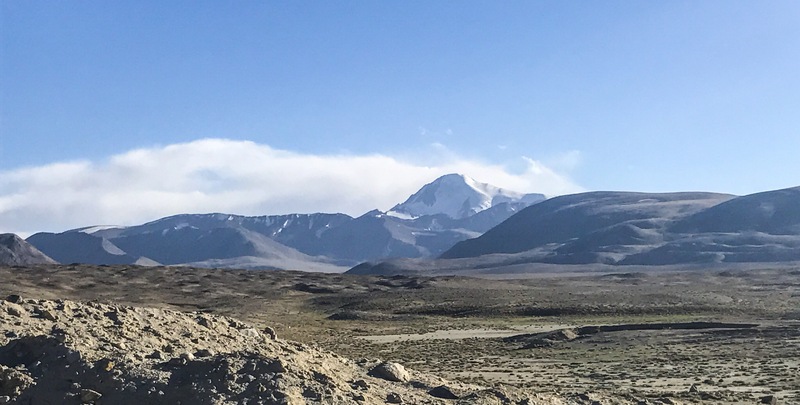 We breathed a sigh of relief, having all feared another night in the freezing atmosphere of the Pamir Highway. Two nights in Kyrgyzstan was enough to get our first impressions of what was to come. Yurts spotted grassy landscapes, and plains became less hard-edged, rolling to the peaks that shrouded them. We stopped to change driver, at around 10,000 feet. Three men on horses waved us over to their small home sprawled across a flat in the landscape: a single yurt, small unlit out-house, and tethered horses marking the edges of their land. A goat lay on the floor, suppressed by the knee of the father of the family. It’s legs tied, it could do little but to screech at the top of its voice. He held a large knife. Through hand signals and gestures we were invited over to witness the slaughter. Despite being one of those experiences that would have been remembered for ever, we declined respectfully. I have no issue in killing an animal to eat, but when I have no intention of eating it myself, the experience I felt would be unnecessary. Plus, I’m now back onto being a vegetarian! We crossed to Kazakhstan the next day, stopping just north of Almaty for the night in the very odd town of Kapchagay – the Vegas of the Stans: casinos, booze, and hotel rooms by the hour. We’d worked out that up to this point we were just a single day behind schedule. We thumbed through our paper work, rechecking our timeline for the remainder of the journey. Our plan has always been to fly home from Ulan-Ude, shipping Judith by train to Lithuania where we’d then drive her back the short skip to London . The shipping however, only operates Monday to Friday – an oversight on our part. Arriving into Ulan-Ude on the Saturday and flying back on the Monday was no longer an option. We’d need a clear two days to empty the car (absolutely everything!) and get the paperwork sorted for the shipping. This shift means we would now need to hit the finish line on the Wednesday before, shaving almost three days of our drive. Our revelation came just at the right time, as we planned our next week traveling through Mongolia – the main event! The North – impassible in places by rivers and floods, the central route – mostly tarmac and boring, the south – unknown. With 7 clear days to get through Mongolia, we’re still undecided on which route to take. All we know for sure though is that if we make the wrong choice, it could see us back in London much later than planned, and possibly jobsless!